Bored of wearing your old outfits in the same, standard manner? Add some spice to your daily clothes by accessorizing with the right kind of jewelry. A bold chain, statement earrings or bracelet cuffs can make the world of a difference to your attire. But while accessorizing, playing around with the right kind of accessories is essential. Be attentive to small details like your face structure, features, hair etc. as they must be taken into consideration when accessorizing. Here are a few tips to help you pick the perfect jewelry for your outfit. Apart from brightening up your clothes, earrings light up face too. Hence, when picking the perfect pair of earrings, take your face shape as your guide, different shapes and sizes of earrings are worn on different face shapes and structures. Oval face cut: This is the easiest face structure to dress up. All types of earrings suit an oval face shape, from statement chandeliers, thin hoops to small studs, even oval shaped dangled earrings. But extremely long dangled earrings may make the face appear too long, so avoiding it is best. Round face cut: As those with a round face cut have wide cheekbones, angular earrings with geometrical shapes or drop earrings will make the face appear more angular, round big hoops will only blend with your face structure making your face seem wider. Square face cut: Thinner earrings with oval or curved danglers, earrings tapering to the bottom or small circular earrings look best with a square face cut. As those with a square face cut have heavy jaw lines, avoid wearing long and wide earrings that would draw attention to the jaw line. Heart shape face cut: Triangular shapes like oval or teardrop earrings suit this face shape best as it offers more width to the narrow jaw line. The ideal earring shape would be anything that is narrow in top and wider at the bottom, helping elongate the face. Long face cut: Smaller, simpler circular or square shapes compliment this face structure as anything long or dangling will only make the face shape appear even longer. As statement jewelry is the latest trend, make no exceptions for statement bracelets. But there are a few rules you need to follow when making a statement. While bold earrings and cuffs go well when paired, only proceed to do so if you are wearing a self coloured or plainer top. Too many designs and prints will clash with your jewelry. If you’re stacking many bold bracelets, only do it on one arm, leaving your other arm bare. Your carefully manicured hands deserve to be dressed up too. From simple multiple rings to bold cocktail rings, there are plenty of options to select from. 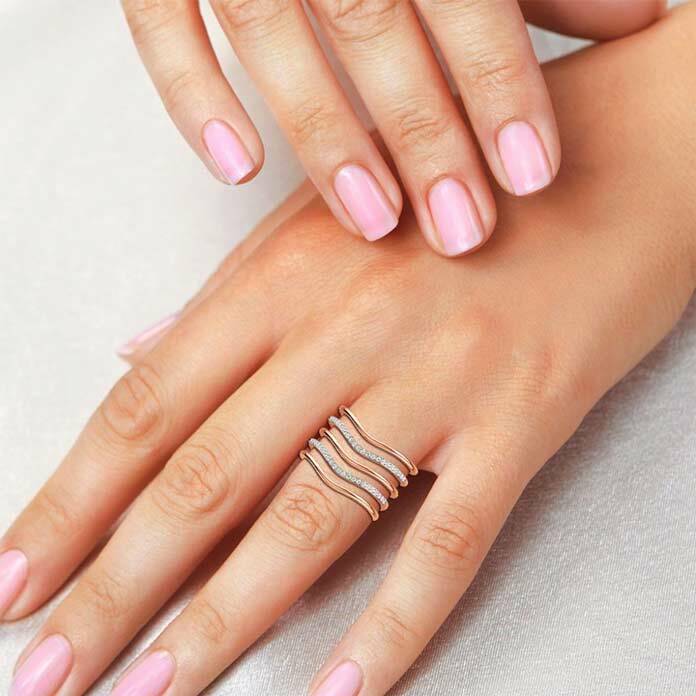 Avoid bright glittery polish if you’re stacking multiple rings, keep your polish simple so that you can go all out with the ring accessorizing. The number of ways you can play around with your necklaces is never ending. From layering your simpler pendants to the long chain trend, the list goes on. The neckline and print of your top plays an important role. Self colored tops, round or v-necks look best with statement neckpieces. If you’re wearing a statement neckpiece then do not wear any other large jewelry, like big earrings. The idea is to make a statement while maintaining space and balance in your outfit. Strapless dresses or bare shouldered tops go well with big bold necklaces. When accessorizing, the focus is not only on completing your outfit. Let your personality shine with your selection of jewelry. Go ahead and play around with these different accessorizing techniques and add a spark to your outfits. Your boring, old clothes seem new and exciting once more. Andy Bell is a blogger who loves to write about various topic under Lifestyle. He works for 'For Die hard Fan'.